One of the first “unknowns” you may encounter when you begin the divorce process is who will get to stay in the marital residence while the divorce is pending. Regardless of whether your marital residence is an apartment or house, whether you’re renting or you own the property, the court can order one spouse to vacate the residence and award possession to the other. A spouse who is seeking to remain in the home (or, a spouse who is looking to remove his or her spouse from the home) may file a motion for exclusive possession of the marital residence. A hearing will be held on the motion, and the judge will decide who should be granted exclusive possession of the home. If one spouse is awarded physical custody of the children, usually that spouse will be awarded possession of the home as well. Judges seek to minimize disruption in the children’s lives. Allowing them to remain in their house is less change. If one spouse owned the home prior to the marriage, then the home is likely going to be considered that spouse’s premarital property. A judge may be more inclined to award permanent possession to the owning spouse. However, this factor alone may not be determinative for who should be allowed to remain temporarily. Typically, the spouse who is awarded possession will also be ordered to pay the mortgage (or rent), utilities, and other similar expenses. The judge may take into consideration as to who can afford these expenses. However, if the spouse who wishes to remain in the home cannot afford it, he or she may ask that the other spouse pay the household expenses. Depending on the circumstances of your particular case, it may be clear who is going to remain in the home post-divorce. This can be a reason for a judge to award that spouse temporary possession. Let’s say Spouse A is seeking to have Spouse B excluded from the home. If Spouse B has friends or family in the area to stay with temporarily, a judge may be more inclined to grant Spouse A temporary possession. If one spouse has a health condition that would make moving from the marital residence a hardship, which could be good reason to allow him or her to remain in the home during the proceedings. If a spouse runs a business from the home which could not be readily moved, say an in-home daycare business, the spouse who runs the business would have a strong argument for being awarded possession. Abusive behavior is another consideration for excluding the abusive spouse from the property. Of course, every divorce case is different, and the unique facts of your case will influence the judge’s decision. 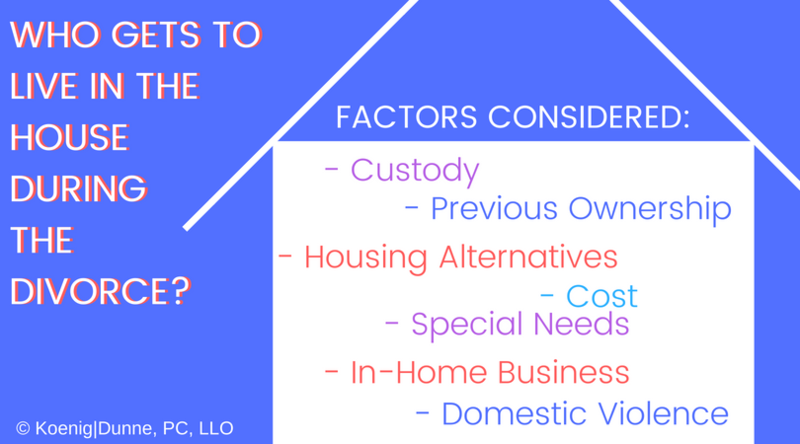 If staying in your home is important to you, talk to your Koenig│Dunne attorneys about your reasons so that a strong case can be made for you at the hearing.